In our first article on LuLaRoe leggings, I introduced you to a consultant named Kristi Trimmer. She developed an online presence as a travel blogger, and last fall she decided to get involved with LuLaRoe. I want to share her experience with you as an example of how nearly impossible it is to make money in multi-level marketing. Of course, she is just one person. People have different experiences. But what you will find over and over is that it is nearly impossible to turn a profit retailing products in MLMs and 99% of people lose money in MLM. Today I want to show you more of Kristi’s numbers to demonstrate what a loser LuLaRoe is as a business. Kristi has a private Facebook group for her LuLaRoe sales that has over 5,500 members. Remember, she developed a following as a travel blogger, so she has a very large network. That’s an impressive group size. So you’d think that helps her generate a lot of interest and a lot of sales. But it really doesn’t. Over the last week, I took a look at 4 live sales that Kristi did. Each was an hour to an hour-and-a-half long. From each of those, she sold: 3 pieces, 8 pieces, 7 pieces, and 3 pieces of clothing. It’s easy to see how many pieces were sold, as a participant has to comment “sold” and the number of the item they wish to buy. That’s 21 pieces of clothing sold in one week via Facebook live. With 5,500 group members, that sounds terrible. How much would the average person with a couple hundred followers sell? But the numbers get even worse… Kristi shared in a March 12 video how much she’s selling. The results are pitiful. Kristi says she works 40 to 60 hours per week on LuLaRoe and has about 300 pieces of inventory on hand. She sells about 30 pieces per week, and she said that was about $900 profit per week or $4,000 profit per month. Her math was wrong. 30 pieces a week at full price (average $40 each) will mean $1,200 in sales. (Note that consultants will tell you it’s probably more likely that the pieces will sell for $30 each after discounts and incentives.) 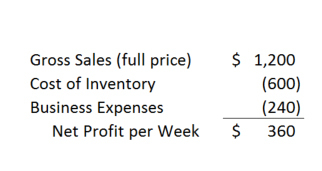 That is $600 gross profit per week (if sold at full price), less all other costs. Kristi reports that about 20% of the sales amount goes into business expenses, so she is profiting about $360 per week or $1,440 per month. If Kristi works 40 hours a week, that’s $9 per hour. If she works 60 hours a week, that’s $6 per hour. So after investing $7,000 in a “business,” Kristi has given herself the opportunity to earn $6 to $9 per hour! I understand that her sales volume may grow over time, and that will help her earn more money. But if she’s working full-time at this (even putting in overtime! 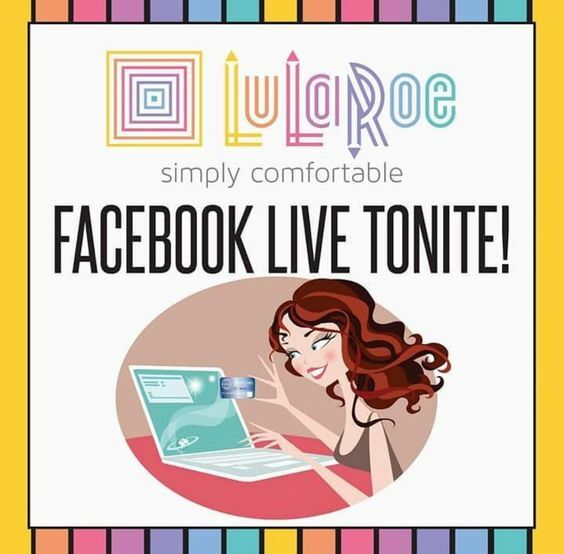 ), and she has over 5,500 members in her LuLaRoe Facebook group, and she’s still only making minimum wage…. how much would the average person with no online following be able to sell? The point of this article is not to pick on Kristi personally. I think she believes in what she’s doing and I think she sees LuLaRoe as a great opportunity. I am simply using her LuLaRoe venture as an example of how horrible this company is for consultants. She has a very public presence and has provided information about her experience that is really instructive for us. Sadly, I don’t think Kristi is being realistic about her chance of making this into a real business. LuLaRoe recruits should take this type of example very seriously. She made $938 more on those 154 pieces than they cost her, but she is still over $3,000 in the hole because of the high initial inventory cost. That’s what will kill you in any business, spending more to get inventory than you get back selling part of it. In any business, it’s critical to keep track of the cash flow … yes, there are times when it will be negative, but unless it goes positive and stays there, you are in trouble. She also spent $500 on expenses that first month, so it was $3,653 out the door. She will never make a profit with such low stock. I’m not sure what she is suspending 40 hours per week doing, but as a consultant myself, I am not positive I could spend 40+ hours per week doing with LuLaRoe and I have 1200+ pieces in stock. I’m not saying it’s easy. It’s hard work. And I’m not sure I would recco anyone join without telling them it’s hard work. But! I still enjoy it and I don’t count on it for steady income. It’s money I use to pay down debt now that I have paid myself back that initial investment. I do feel better about my weekly live sales numbers…sometimes I’m lucky to sell 10 items. Other times I am on fire and have sold 25 items. I keep plugging along and will do so until it’s not fun any more. Newsflash Kimberly.. .your profit isn’t tied to how much inventory you have. It’s tied to how much you sell. Kristi is putting in full time work and can’t generate enough sales to support a household… having more inventory isn’t going to change that. She sells what she sells to her audience of 5,500. In theory more choices would lead to *some* additional sales, but unless she races through and shows a zillion products in the same amount of time, how would she generate substantially more volume? Also, nice try at linking to your sales group on Facebook, but…. NOPE. Hi, Tracy, just now seeing you replied to my post and I’d like to explain, in case my comment was not clear. I’m just mentioning what works for me. I think a lot of the issue is with consultants who joined at the very beginning and saw their inventory FLY out with little work. It’s no longer like that. Many consultants (former and current) were told it was “SO EASY” to make money with LLR. it’s not easy. it’s work. right now it’s even harder with all of the GOOB sales and market saturation. It may pick up again, it may not. I have a lot of open houses and try to find “new eyes” for my inventory. Additionally, my original reply was not snarky, and if I offended you or anyone else by putting my link in my reply, for that I apologize. But I did not warrant the snark/tone of your response to me for merely sharing my opinion and mentioning that it’s hard work. Oh please Kimberly. There was no “tone” to my response, simply facts. If you can’t handle facts being given back to you, you might rethink participating on sites like this. You didn’t “offend” me by offering your link. It was just sneaky and not allowed. Get a grip, girl. Having 1200 pieces in stock is $15,000 of your cash sitting on your shelves. To make a profit you will have to sell enough of it to get the $15,000 out of there. sometimes I’m lucky to sell 10 items. Other times I am on fire and have sold 25 items per week? … so without buying any more inventory, it’s going take you well over a year to sell it off. If you were “on fire” selling 25 items a week consistently it would take you until next February. No company I have ever worked for every thought of inventory as anything but a potential loss. The goal always was to keep inventory just high enough to satisfy the predicted demand. Any move to increase profits and cash flow always involved making inventory SMALLER, not BIGGER. A “profit level” for inventory is 100% an MLM thing to encourage the resellers to buy more than they can possible sell, not a business management principle. that sale number was for a one hour sale once a week. I am also doing pop ups, open houses, vendor events. Not just that one sale, that was merely an example. Sales – no matter what you’re selling has its ups and downs. “She will never make a profit with such low stock.” The old “can’t sell from an empty wagon” schtick eh? But if this is so great, why can’t she sell every piece? Are you saying that there is inventory that people won’t buy? Because even if I buy 1 piece and resell it at double the price, I should profit…right? Sounds like just a time-consuming hobby. Most of the clothes are ugly. There were multiple times that I looked at something that I thought might fit me but knew that I would pass it by in my closet every time for something that I actually liked. So many of the prints are just like…what??? They look like something that my 60+ mother in law would wear, which is fine, except I’m 35. I did buy a pair of leggings, but asked about a couple other pieces, and the consultant didn’t respond to my questions. I noticed that she did this to other people and finally responded just before the party closed and invoices were sent. Hmmm…..sales tactic? In conjunction with the observation that many of the pieces were just ugly, I thought to myself, “who is buying this stuff?” And that’s how I went down the rabbit hole of research on LuLaRoe. I went on Ebay and found thousands of pieces that you can tell nobody wanted. How does this make sense?? And also found Facebook sites devoted to reselling LuLaRoe. Why does this stuff need to be resold so much? Why does it have a HUGE Ebay presence if it’s so amazing? The kicker was when the consultant posted a picture in the Facebook sale of two pieces. One was a loud black and white print, and the other was a purple/pink/orange paisley. She said that these two things would go GREAT together, she’s crying they’re so beautiful!! Uh….either I haven’t been drinking enough or too much because I would never. ever. ever. put something like that together. I found another Facebook group and a consultant stated that she had just received a shipment of leggings and that she “had to hold herself back from keeping all of them! !” All of them? Really? While I found multiple good reviews of the leggings and one style of dress, very few favorable reviews seemed to exist for the other pieces in the LuLaRoe line. This company definitely seems like the typical MLM scheme, just like the Mary Kay that my friend barely broke even on, and the Arbonne that my other friend begged me to order, and the doTerra that’s seemingly bankrupting another friend. Sidebar: my best friend was a Mary Kay consultant for a brief time. She spent so much time and effort on it. Her delight and enthusiasm were great, and I was happy to see her so happy. And then she wasn’t making sales but was pressured to buy more inventory. She tried so hard. It hurt to see her go from so excited to defeated. She closed her business and had to liquidate her inventory, most at a loss. I hate Mary Kay. I hate what it did to her and I hate that they sucked her into this shiny, glittery, rainbow world of dollar signs. Anyone that has ever taken a marketing class or done any research on marketing can see that this is nuts. The whole “unicorn” thing….nobody who sees you in the grocery store knows you got a super rare piece, they only know that you’re wearing Sasquatch leggings and you look like you’re certifiably insane. The versatility of the pieces….I don’t want to wear a skirt as a scarf. I just don’t. The trendy colors and shapes used on the websites/Facebook pages, the super excited dialogue, and the “you can wear this ANYWHERE! !” are sucking rational people into donut leggings and Easter egg colored tshirts. Could this MAYBE be something good? I just don’t see it. Thanks to Pink Truth, the cost/benefit breakdown doesn’t show that LuLaRoe makes sense, just like so many MLMs. While some of the pieces could be styled and seem comfortable, I most likely will be staying away from the whole LuLaRoe experience. And I hope that people can really, really try to figure out if this type of business makes sense for them. Leah B, There’s a Facebook group of about 20,000 people called, “LuLaRoe Defective/Ripped /Torn Leggings And Clothes”. Please check back in with us once you get your leggings and let us know the quality. I think LuLaRoe is facing at least four lawsuits at this time. Yet people are still buying into this scheme as a viable “business opportunity” – gag! There are two lawsuits for copyright infringement for using artists’ work on clothing without permission. One lawsuit for illegal collection of sales tax that is pending as a class action. Five pending class action lawsuits for holey leggings and other quality issues. You can replace Mary Kay with LuLaRoe. Or ItWorks. Or Arbonne, etc. My favorite upscale resale shop is receiving LLR pieces every day now and posting photos on Instagram. I was curious about the look, fit and feel so I went in to try them on. The “feel” of the leggings were great. I saw that appeal. But that was it. Here were my thoughts after trying them on. First they were being sold at the resale shop for $10. That means that the consultant trying to get any $$ on them was only paid $2. That’s how this store operates. That is a huge loss. Second, I tried on 3 leggings – two LLR and one from another line that was selling for $6. Guess which one I liked best? You got it, the unknown $6 brand. It had the same buttery feel but had more length, a better waist band and fit better. It was also a smidge thicker. I am 5’7, a size 8 and 140 lbs. I am a medium all around. The two LLR leggings didn’t fit the same yet were both OS. They were both tighter than the $6 ones. I thought OS was supposed to fit people up to a size 12. Not these. I was not comfortable in either of them. One was from China and one from Indonesia. One had a nice print that lined up on the front but didn’t on the back. That matters!! I looked at the other LLR clothes and agreed with Leah B. They were SO UGLY. The fit didn’t make sense. They were huge. Again, the small tee was massive on me and looked like a box. My take away from my first real experience with these products was that the sizing doesn’t make sense. Leggings are super small and the rest is super big. Nothing is consistent and prints don’t line up. Why would anyone “invest” $6000 in this product line? If you love it, you can go on eBay and buy it for so much less. Or why not go to your local resale shops who undoubtedly carry them now? It’s such a scam. My resale shop sells such beautiful high end clothes at the same price point as LLR. If I didn’t know that it was an mlm, I would have compared the line to something from Rue 21 or Walmart and questioned why they were selling the leggings for $10. Wow! I haven’t been able to try on any of the clothes myself. Rue 21 quality?! Appalling. Just another scam company preying on women trying to make a living. The sizing IS crazy. I can wear a LuLaRoe Small and I’m a size 12 in normal clothes. The shirts are huge. And the prints? a few of them are ok, the rest are horrid. One of them I saw was hot dogs. HOT DOGS? Really? Am I 4 years old? No! I bought a t-shirt dress from a friend’s pop up. I regretted it instantly–$50 for a t-shirt dress. I don’t understand how you can take one consultant’s “numbers” and submit that as “proof” of the company being a failure. I’m not saying that every consultant is getting rich, but those who put the work in do make money. Why include a consultant’s name in such a horrible post, too? Bullying at its finest (err, worst). I was a consultant for a short time, with a group of less than 1,000 members I never did a live without selling at least 20 items. Sometimes more like 40 items. LuLaRoe isn’t all around horrible. Do it, have fun with it, and hop off if you don’t like it anymore. No need to get all rude about it. Well, first, they’re not “numbers.” They’re numbers. Putting them in quotes makes it seem like they’re not real. According to Kristi, they’re real. And they’re pathetic. The point being made is that if someone with such a large following has such poor results, that doesn’t bode well for the ordinary woman who doesn’t have such a following. I am amused at the idea that this is bullying. So a consultant can brag about her numbers and alleged success, and I’m not allowed to break that down and show the reality behind it? Telling the truth about what a horrible “opportunity” this is has now become bullying? I’m sorry that you think exposing the truth about MLM is rude. If that’s the case, then I’ll just continue to be rude, because someone has to do it. I notice you said you were with LLR for a short time, then you quit. And you had some sales of 20+ items each. Knowing that you have to onboard with a very sizable inventory, I don’t doubt that you got enough decent pieces to have some sales of 20+ pieces. What I’m wondering is how much you had left, unsold and unreturnable, when you decided that LLR wasn’t fun anymore. After subtracting the cost of those items people didn’t buy, did you really make any money? I also don’t swallow the “wasn’t fun any more” bit, as if the mandatory buy-in wasn’t a factor. LLR isn’t a no-strings-attached volunteer gig. It’s supposed to be a money making business. You can’t just “hop off” after a few moderate sales unless you’re so wealthy that the inventory buy-in doesn’t matter. Telling the truth about something is not bullying. FB is filled with desperate consultants who are going out of business. The problem is that no one’s buying, even with discounts and freebies. Consultants were selling on FB as part of LLR groups, but having GOOB sales and discounts is causing them to be kicked out of the groups, so now they have nowhere to sell. You dare to GOOB and sell below the suggested price? You will be named and shamed by your “sisters” and called every four-letter word and combination thereof. Consultants who returned defective items are owed hundreds of dollars, only to receive more defective items — returned by other LLR consultants — that still have the original consultants’ tags on them. Incredibly, people are still signing up to be LLR consultants, claiming they know nothing about defects or lawsuits. I am going to start keeping track of the numbers on ebay every month. My guess is that more and more women are going to start unloading their entire inventory on ebay. I would also bet that many of them will sell it at cost just to break even and at least not be in thousands of dollars worth of debt from the whole debacle. I’ve got a friend who is about to sign up for LuLaRoe. Looks like it’s time for me to have an intervention with her. I have been a fashion reseller on eBay for a few years now. I spent around $500 a month on thrifting to make around $2000 in sale, profit around 30-40%. My sale goes up slightly every month. Most of my inventory eventually sell because I get to pick my inventory to ensure quality. And there is no rule at all!!! I spend less than 10 hours a week to run this true small business of my own!!! I have friend invites me to join her LLR team but after I looked into this I can’t believe they have to spend this much to start off and have so much dead inventory and many rules!!! They are so desperate on sale so even tho they have a lot of dead pile they still non stop ordering more… for me, spent $10 to make $10 is non sense… plus all the other costs… too much to make this little money!!! The cost of their products is too high for that kind of quality. My parents have been in textiles business for ages so i know. I think most of the women who do this think they are “too good” to do that kind of work and that they are meant to be “businesswomen” or something. Likely true, but this doesn’t account for the women who actually WERE businesswomen, like attorneys, doctors, accountants, etc., before being sucked in. I don’t know if you Pink ladies have been watching the Lularoe debacle since this article was published. The fad is winding down and sales are in the toilet. They’re leaving in droves for multiple reasons and going out of business sales have just about tanked demand at full retail prices. I can tell you that almost all of the consultants in a certain heavily populated Facebook group who are going out of business report that they LOST money. Yes, they are finally able to speak openly about this because they’ve found safety in numbers. Some of them are facing losses as much as $12-20k. It’s not unusual for the consultants to talk about how up to 50% of the products they ordered did not sell because they are too ugly for even the lula-addicted. Then the quality issue sprang up and dropped them even deeper in the hole. Now that they’re going out of business they’re breaking the rules and advertising below the MAP price to try to recoup some of their losses – and it’s not nearly enough. These are mostly women who never made it a year as a Lularoe consultant. You fine ladies are right to question anyone associated with this company who claims they made significant earning just selling the products. The only ones making big profits are at the top of the pyramid, and they’re making that money on the purchases of their downlines. That’s soon to change to sales-based commissions, which I suspect will cause even more to leave. I don’t believe that anyone but the top 5% of consultants makes any real money doing this. I do believe that smaller consultants make a little money each month, but I do not believe that they are not in the hole to the tune of 30k in inventory to do that. In other words, most consultants who “make a profit” each month only do so because they went into 30k worth of debt to have a large inventory. Thus, they are not really make much money. Also, most of their inventory is unsellabe because it is ugly crap that no one wants to buy. So once LLR folds, these people will have 30k worth of clothes they cannot unload. LLR, like all MLMs is a scam to everyone accept maybe the top 5%. together with business, science and technology https://math-problem-solver.com/ . This is taught utilizing outdated century instruments often known as Abacus.